You are here: Home / 2017 / Electric Autos, Air Pollution, and Solar Power – Does the Future Look Bright for India? Last week our group visited the Taj Mahal in Agra and did a tour of New Delhi. The Taj was beautiful and the tour was stimulating, but there was one thing I noticed that each had in common: electric autorickshaws. 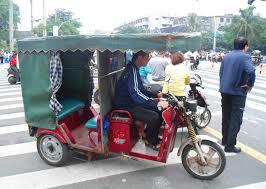 These autorickshaws have an electric battery powered engine instead of one that is diesel or gas powered. Because they don’t have a combustion engine, they are quieter and do not produce exhaust like normal engines. These autos seem to be superior to the normal ones we’ve seen everywhere else but there were only a few being used, mostly for tourists. We were still sitting in traffic with plenty of other cars that were spewing out asthma-provoking exhaust fumes. That experience also reminds me of the hybrid-electric vehicles in America and Tesla’s full electric cars. Hybrid cars have been growing in popularity in America and Tesla is making high-end luxury/performance cars for people who have the money. We haven’t seen much of hybrid electric vehicles in India besides these autorickshaws. I would think that they would be more prevalent with the current air pollution problems going on and the threat of global climate change. Delhi has put some government schemes into effect that promote the adoption of these vehicles but it is not a big deal in most other cities. There was a big push toward hybrid electric vehicles in the US as a part of the green/eco-friendly movement but also to increase fuel economy in personal cars in response to the threats of global climate change. Tesla has recently released a fully electric 18-wheeler cargo truck which is groundbreaking because big-rigs are a large source of air pollution and are widely used by corporations to ship things across the US. Hybrid/electric vehicles in the US seem to be progressing a little more slowly in recent years but perhaps that is because the green movement is not sensational anymore and US environmental policies have declined. In India, air pollution is noticeable and part of some companies’ sales pitches. For example, Dove beauty products have a shampoo that is labeled “environmental defense” to protect your hair and restore it after being exposed to heavy air pollution. The company recognizes that air pollution is a common concern for many Indians and have used that threat to sell a product. Since they are noticeable problems and health concerns to all Indians, global climate change and air pollution are being addressed by the government. Modi is trying to get India to have 100% hybrid/electric vehicles by 2030, a goal which seems impossibly large and ambitious. Modi has a good reason to take drastic measures, as 13 of the 20 most polluted cities in the world are in India. What is the reality of air pollution in India? It is a constant reminder of how the large population, when coupled with lots of polluting vehicles, can affect the environment. Whenever I read the newspaper there is always a section on sports, politics, and even daily pollution levels. The metric they use to describe air pollution is the PM 2.5 or the concentration of fine particulate matter in the air. They simplify it in the newspaper by color-coding the severity, with red being the worst and green being the least severe. That said, I don’t need a metric to tell me that the air in Indian cities is heavily polluted because it is quite noticeable. We have flown to many cities and have seen the smog (smoke mixed with fog) clouding the horizon during takeoff and landing. You can’t see anything beyond a mile in Delhi and it is usually not much better in other cities. There is a distinct cloud of smoke in the air on some days when the farmers from the nearby countryside are burning old crops. Besides air pollution, noise is another thing I’ve noticed, especially when compared to the silent electric auto rickshaws. Reducing noise pollution isn’t a priority but a nice secondary benefit for utilizing electric vehicles that do not have a combustion engine. Personally, I am a big fan of electric vehicles because they are quiet, something that has been a problem for me since we have been staying right next to the highway at the YWCA and various hotels. I suppose that it wouldn’t be a total solution to noise pollution, knowing how much Indian drivers rely on horn signaling to drive. Autorickshaw sales have been a growing market for years, seeing 10% growth annually since 2010. Only a fraction of a percent of that growth is from electric autorickshaws, as they are not universally adopted yet. The national and state governments have been putting some proposals and plans into action to reduce automotive emissions and to promote electric vehicles, especially public transportation and autorickshaws. Modi’s goal is to have 100% of the vehicles on the road be electricity powered by 2030 and have 100 gigawatts of solar energy production by 2022. These are lofty and expensive goals that go hand in hand, as the increase in electric vehicles would put a lot of stress on the power grid. FAME India (Faster Adoption and Manufacturing of Hybrid and Electric vehicles in India) is a scheme enacted in 2015 to promote the sale and use of electric vehicles in India. It has a few components that give subsidies to companies to increase production of electric vehicles, subsidies to consumers/businesses to buy them, and plans to construct new infrastructure such as charging stations. After the incentives, the cost to buy electric autorickshaws can be cheaper than ones with a combustion engine depending on where you buy them. Another scheme is the National Electric Mobility Plan (NEMMP) for 2020 that aims to get 5-7 million electric vehicles on the road by 2020 to reduce oil consumption and vehicular air pollution. There were 42,000 electric vehicles sold in 2012, but only 20,000 sold each year since then, indicating its diminishing influence and interest to consumers. Promoting electric vehicles seems to be a good idea, but there are some issues with how it might play out in India. Although hybrid electric and fully electric vehicles can reduce the air pollution problem that lots of Indian cities face, there are a few concerns about how effective it is in protecting the environment. One argument is that the production of electric vehicles is not environmentally friendly and that the pollution saved from reducing exhaust emissions is replaced by car/battery production. Their production displaces, not replaces, pollution from the exhaust pipe to the factory. India will also need a lot of electricity production to keep up with the demand, but most of India’s electricity comes from coal! This problem is supposed to be addressed in Modi’s plan to have 100GW of electricity on India’s grid from solar energy farms. That goal is very high and has some flaws in sustainability. Solar panels do not last a long time and are expensive to install, but it would truly be amazing if he gets India to pull it off. The problem is that coal is the cheapest way to produce electricity because it is abundant in India. There is no incentive to use solar energy over coal, so the government is giving incentives for installing solar panels. Madras Christian College, one of the many places we studied at, just installed a solar energy farm to help power their facilities. Although they can sell their excess electricity to the government for profit, our student guide Jim said their farm is not sustainable and the panels will need to be replaced in 10-15 years. Incentives are a common theme in Indian law and economics, and electric autorickshaws are no different. Electric vehicles are not a growing part of the market, so incentives have been put in place to influence people and companies to make and use them. That said, there are few options available on the market for consumers because there is no interest. You can buy a normal combustion engine car or motorcycle for cheap, gas is cheap, and nobody knows how to service an electric hybrid in India. It seems that there is a lot of work to be done if Modi wants to reach those lofty goals by 2020 and 2030. As I prepare to go back to the US, I’m thinking about the Trump administration’s efforts to curb the Environmental Protection Agency (EPA) and their policies to defend our health. Some national parks are being reduced in size, scaring me and many of my outdoors enthusiast friends. Hopefully the environment won’t be totally thrown under the bus in America for the benefit of economic growth. Looking at India, there is a conflict between the goal to adopt solar power and electric vehicles and Modi’s pledge to keep India’s GDP growth up to 7% each year. Coal powered electricity plants are keeping India in the game and are only increasing in scope to help maintain that GDP growth. I like seeing that the electric vehicle and solar power schemes are in effect, even if they are not reaching their full potential. India is a beautiful country and I hope that clean energy makes a comeback here so that Delhi and the rest of the country can be enjoyed with clear skies and healthy lungs. 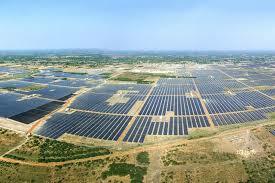 These images of the world’s ‘largest’ solar power plant in India will leave you awestruck!